Approximately 30 million workers are exposed to hazardous noise on the job. In Michigan, an estimated 86,000 workers have work-related noise-induced hearing loss. Despite the fact that it is 100 percent preventable, loss of hearing is one of the most prevalent occupational diseases in the United States and the second highest self-reported workplace injury or illness. 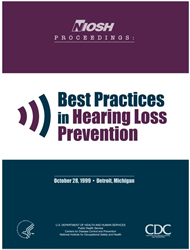 On October 28, 1999, leaders from industry, government, labor, professional and trade organizations, and academia met in Detroit to share best practices for preventing work-related hearing impairment. The symposium highlighted an array of proven strategies and new advancements for protecting workers’ hearing.